This smooth, scale-less chimaera can grow to 24 inches long, a good deal of which is the long tail. It’s named for its brown-gray iridescent coloring, spotted with white. It has a short, rabbit-like face, large triangular pectoral fins, and a short dorsal fin that starts with a venomous spine. Chimaeras split off from their cousins, the sharks, almost 400 million years ago, and have been deep-water fish since, for the most part. The spotted ratfish is one of the few that migrate close enough to be caught in deep sea fishing, and should be handled with care. English language common names are spotted ratfish, angel fish, chimaera, elephant fish, ratfish, spotted rattfish, and white-spotted ratfish. 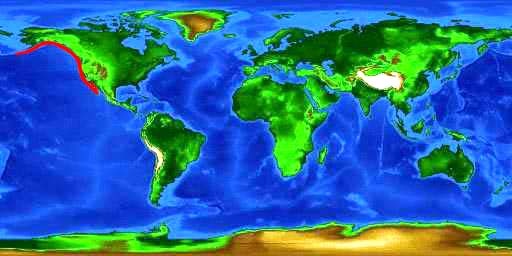 Other common names include Amerikanskiy gidrolag (Russian), chimaera elefante (Italian), chimera amerykanska (Polish), chimère (French), chimère d’Amérique (French), chimère tachetée (French), ginzame (Japanese), guumaa (Tsimshian), havrotte (Danish), k’aa un (Haida), quimera (Spanish), quimera americana (Spanish), quimera manchada (Spanish), quimera-americana (Portuguese), ratazana americana (Portuguese), ratón (Spanish), rattenfisch (German), rattenvis (Dutch), Seeratte (German), skvrnitá morská krysa (Czech), skwome (Salish), vitfläckig havsmus (Swedish), and zeerat (Dutch). Although the spotted ratfish is not a targeted species, it is taken as bycatch by commercial trawl fisheries and recreational fishers. It is generally avoided due to the tendency of the dorsal spine to become tangled in fishing nets. It is rarely landed in its more southern distribution range due to its occurrence at depths greater than (180 m). Due to its wide distribution and depth range, it is believed that the impact of the fisheries is minimal. However, the spotted ratfish has the potential to become threatened by inshore trawling activities. Although this species is considered a “trash fish” and has never been of commercial interest, it may become targeted in the future as other more desirable species become depleted. Although not considered dangerous to humans, care should be taken when handling this fish due to the dorsal venomous spine that can cause painful wounds. Care should also be taken when handling male specimens due to the presence of sharp clasping organs. The spotted ratfish is currently listed as “Least Concern” by the World Conservation Union (IUCN). The IUCN is a global union of states, governmental agencies, and non-governmental organizations in a partnership that assesses the conservation status of species. > Check the status of the spotted ratfish at the IUCN website. Currently there are no conservation measures being taken for the spotted ratfish, however in Oregon (US) trawlers use gear to avoid bycatch and reduce pressure on the ratfish populations. The spotted ratfish is found in the eastern Pacific Ocean from Cape Spencer, Alaska (US) south to Vizcaíno, Baja California (Mexico). It is most common between British Columbia and southern California. 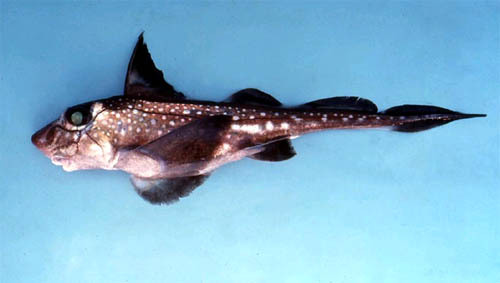 An isolated population of spotted ratfish has been documented in the northern portion of the Gulf of California. Residing in temperate waters, the spotted ratfish live near the bottom from the intertidal zone to depths of 2,950 feet (900 m). It prefers mud and rocky bottom habitats and is often found in bays and sounds in the northern reaches of its distribution. 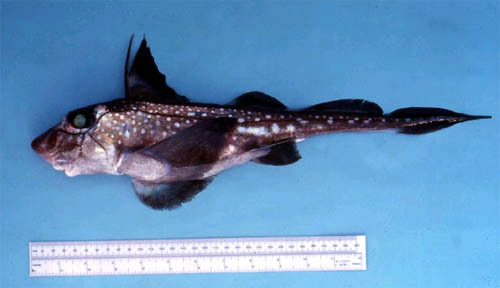 As the distribution range moves southward, the spotted ratfish is found in progressively deeper waters, preferring water temperatures of 45-48 °F (7-9 °C). This ratfish, a member of the Chimaeridae family, has a large rabbit-like head with a broad duckbill-shaped snout and large green eyes. The body tapers toward the posterior end of the fish; the tail makes up almost half the length of the overall length of the entire fish. There are prominent lateral line canals on the scaleless skin of this fish. At the leading edge of the first dorsal fin is a prominent venomous spine that is slightly taller than the fin itself while the second dorsal fin has an undulating profile that gives it the appearance of two separate fins. 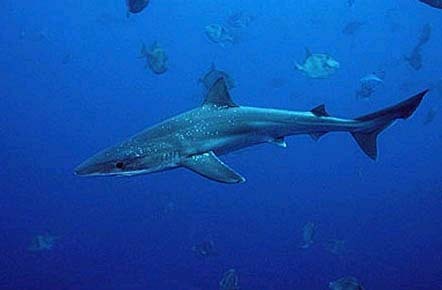 The well-developed pectoral fins are triangular in shape and have fleshy bases. Male spotted ratfish have a spiny, club-shaped process located on the head. They also have sharp retracting clasping organs anterior to the pelvic fins and slender claspers with expanded ends next to each pelvic fin base. The body of the spotted ratfish is brown or gray with hues of gold, green, and blue. There are white spots scattered on the body, resulting in the fish appearing iridescent with a silvery sheen. The ventral surface of this fish is silver and the fins are gray. The spotted ratfish has relatively few teeth. There is one pair of teeth in the lower jaw and two pairs of teeth in the upperjaw, occurring as mineralized grinding plates. 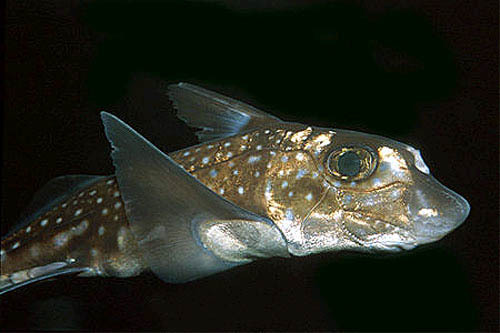 The skin of the spotted ratfish is smooth and lacks scales. The maximum reported size of the spotted ratfish is 23.6 inches (60 cm) total length and 14.2 inches (36 cm) body length. Males reach maturity at 7.3-7.9 inches (18.5-20.0 cm) body length and females reach maturity at 9.4-9.8 inches (24-25 cm) body length. The young measure 5.5 inches (14 cm) total length at birth. Ratfish locate prey primarily though electroreception and smell. As feeble swimmers, these fish seek prey with limited abilities to escape. The spotted ratfish swims slowly close to the bottom substrate searching for clams, crabs, shrimps, polychaete worms, and small benthic fishes. Spotted ratfish are also documented cannibals, feeding on their own eggcases as well as other free-swimming ratfish. Spotted ratfish are oviparous with peak spawning occurring in the spring and autumn months. Following courtship rituals, the female releases a spoon-shaped egg case every 10-14 days over a period of several months. Extrusion of the egg case from the female takes 18-30 hours after which the egg case hangs freely in the water, suspended from the female by a long slender extension of the egg case called the elastic capsular filament. Each egg case eventually becomes attached to the seabed or bottom sediments by the thin tendrils of the egg case. The incubation period within the egg case is approximately 12 months. The young emerge from the egg case at approximately 5.5 inches (14 cm) total length and grow to about 11.8 inches (30 cm) total length in their first year of life. Trematodes are common parasites of the spotted ratfish. Rugogaster hydrolagi n. sp. has been collected from the rectal glands of spotted ratfish collected near San Juan Island, Washington. Otodistomum hydrolagi n. sp. was collected from the coelom of spotted ratfish also from the same area and Plectognathotrema hydrolagi n. sp. was collected from the stomach of a specimen collected offshore from Newport, Oregon. The monogeneans Chimaericola ogilbyi n. sp. and C. colliei n. sp were both collected from the gills of spotted ratfish taken off the coast of Vancouver Island. 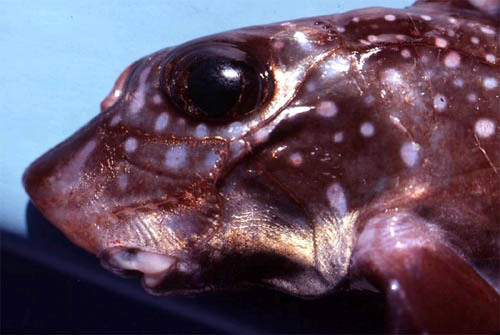 The spotted ratfish was originally described as Chimaera colliei by Lay & Bennett in 1839. This name was later changed to the currently valid Hydrolagus colliei (Lay & Bennett 1839-). The genus name, Hydrolagus, is derived from the Greek “hydr” meaning water and “lagos” meaning hare. Synonyms appearing in past scientific literature referring to this species include Chimaera neglecta Ogilby 1888, Chimaera media Garman 1911, and Hydrolagus media Garman 1911.